Last week, I announced that I’d be giving away a copy of Mary Ann Froehlich’s book, Courageous Gentleness, and today I’m announcing the winner! I used a random number generator to chose the winner from the comments you shared and the winner is: Lisa Preuett. Congratulations! I’ll get the book on out to you! My youngest daughter draped herself across the sofa, seemingly inert and bored, but truly thinking about the great mysteries of the world. So far, so good. Her questions simple, her mind and heart trusting and easily satisfied by easy answers. “Why do some animals like to eat turtles? Falling back on theology or “because God said so” became my frequent defensive position. This curiosity about the world, I love. This exploring and questioning and wondering “what if” and “how come”–while it occasionally makes me explode and bluster out “because God made it that way” or “because I said”– ultimately I appreciate. I’m a questioner, too. I want to know “why” and “how come” and “what about” and “why not?” I want to pester God with question after question like a three-year-old first discovering the world around her. More than that, more than asking God true and honest questions, I nag and whine and push and nudge. Oh, and it’s even more than that. I’ve been Jacob up all night wrestling the angel of the Lord. I’ve locked my grip with God’s and fought hard for what I thought constituted a blessing, for a victory, for triumph over circumstances and over the Enemy who’s been battering at the walls of my life. Yes, I’ve pummeled the chest of Christ with my fists, fighting and demanding, manipulating even, making promises, issuing threats, and crying for mercy, help, deliverance—for rescue. I’m being honest with Him, I tell myself, and honesty is something God treasures in us. He never asks us to fake it or play happy-faced Christian when life is a mess and this mask we wear becomes increasingly ill-fitting. God desires truth. Job, Habakkuk, David, Asaph, Elijah, Jonah, Mary and Martha laid their complaints before God, plead their case, and He listened and answered with awe-inspiring mercy. He didn’t strike them down with lightning. He let them empty out hearts filled with fear, hurt and anger and then He answered, not always in the way they expected or wanted, but still He met them in the place of pain and questioning and carried them on out. Now, though, I’ve been studying the fruit of the Spirit and found I didn’t really get it before. 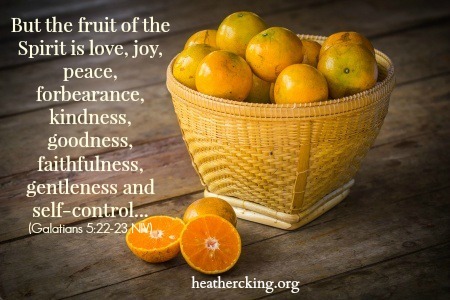 But the fruit of the Spirit is love, joy, peace, forbearance, kindness, goodness, faithfulness,gentleness and self-control (Galatians 5:22-23, NIV). In Living Beyond Yourself: Exploring the Fruit of the Spirit, Beth Moore defines the root word here “praotes” as “the complete surrender to God’s will and way in your life. The term basically means to stop fighting God” (p. 178). Gentleness is submission to God, His will and His way, His plan and His timing and all He has determined for us. How then can I still be honest with Him? How can a prize-fighter like me lower the hands and open the fists, cease fighting and nagging and choose instead to trust? There is my answer in the verse itself, “but the fruit of the Spirit is…” not the fruit of my own discipline or maturity, strength or ability. This is what the Spirit at work and alive within me does—the impossible, the new, the Christ-like—As I yield and grow in the Spirit, so slowly I trust more, believe more, fall in love with Jesus more and understand how much He loves me more. And I stop fighting Him. I drop the knee, I bow the head, I cry the tear, I confess the pain, I trust my God and the Spirit works out Gentleness in me.